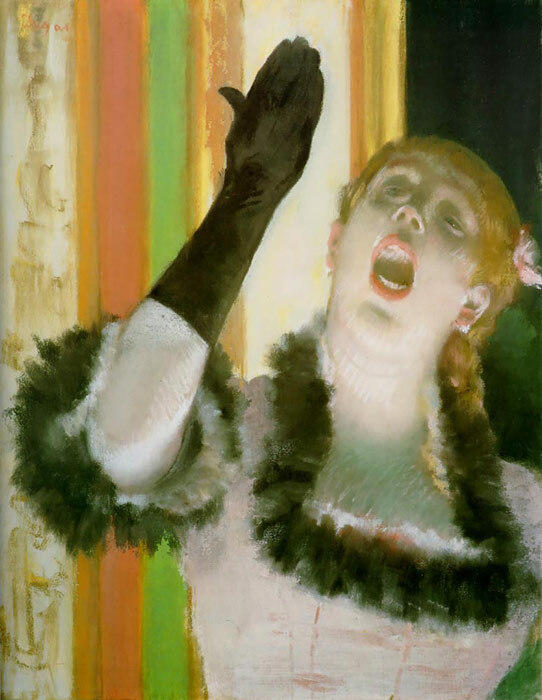 One close look at Degas's Cafe-Concert Singer . This tiny explosive painting, a spontaneous gift of the artist's spirit, seemed to have been breathed directly on the paper in one magical gesture. A closer look reveals Degas's labor. His fingers pushed in ink like modeling clay. His painter's cloth wiped out the black ink for luminous whites. His brush added telling contours. At just the right moment he printed his constellation of tones, not much more than a cluster of smudges. But when the paper emerged from the press, still damp and pliant, those little marks became flesh, hair, fabric: a nose and mouth in one line; a gloved hand, corrected and redrawn. They became a spotlighted cafe singer, bawdy and as aggressive as the strokes that made her. The spontaneity and energy in that little print lifts the medium into art. SPECIAL NOTE : The painter will make the reproduction as close to the original oil painting as possible. If you want your painting to alter from this likeness, please email us and " Cafe Concert Singer, 1878 " will be reproduced according to your special requirements.